Our Feature Gallery presentation is a display of works by some of the designers who have been most inspirational to Giulia Manfredini in her own serendipitous journey from hobby needleworker to designer. This design was originally published in the magazine Fine Lines but will soon be available in chart pak. 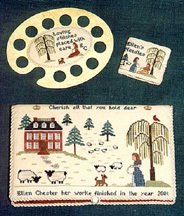 Ellen says of this design, "I think it is most characteristic of the style of designing that I have developed." 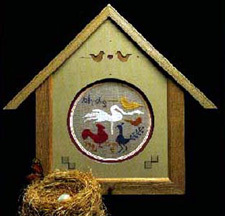 Giulia adds, "All her pieces are wonderful but this piece is an exceptional one with gorgeous colors and seems to exude peace while stitching. I have that issue of Fine Lines and plan to stitch it myself." "My own favorite is, of course the newest, "An Open Heart," emphatically states Cynthia of the Drawn Thread. Giulia comments, "Cynthia makes such subtle and charming use of little motifs and borders to achieve masterly results. I have many of her chart packs and I love to read them while I sit and have a nice cup of tea. It makes me feel happy." surprised to have inspired someone." Giulia adds, "Lori is actually one of my favorite designers. She surprises me with her charming way of designing life's creatures and life's events. I love Bo Peep, Doggie in the Window, A Right Spirit and others." 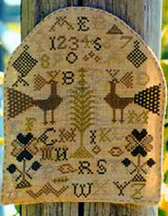 This little sampler was inspired by an antique one seen in a book. It has random Pennsylvania German lettering and motifs and is shaped like a beehive and has a loop at the top for hanging. Giulia states, "I love their pieces that are inspired by the past and keep it still alive and so charming"
My Earth is one of Tina and Teri's new designs. Giulia adds, "I love the whimsically simple and apparently childish style of Tina and Teri. 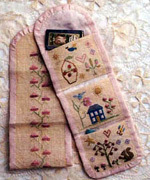 I have many of their needlerolls, some samplers, many kits and I am actually stitching Sophie's Stocking." Sharon's Designs are all so nice it was hard to choose just one! Giulia further states, "Sharon has such an elegance and is proficient in so many techniques and skills. She is a true teaching designer with a perfect choice of colors and motifs." Linda's designs reflect simplicity and love of color. I love her way of using variegated threads. 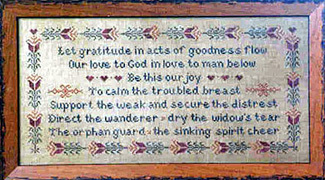 The Stone Cottage Sampler and Two Found Hearts are a perfect example of this. The designs are so simple and yet exquisite at the same time. such as Winghaven and In The Meadows," says Giulia. Giulia notes, "Heart in Hand is one of my beloved designers. They have a simple way to represent life and human events. I love all those nice letters dancing under the needle or above the fabric. 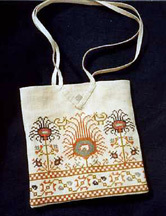 Once again a very nice and simple use of variegated threads." 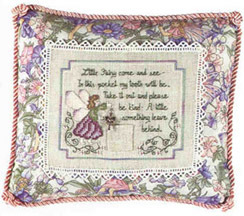 Giulia notes, "The Teenie Tooth Fairy Pillow is one my favorite designs, but all the hearts are very nice. I love her wonderful way of designing and stitching garlands of leaves and flowers"
According to Giulia, "Ewe & Eye & Friends are designing and stitching lovely little creatures and their concept of nature is so quiet and relaxing. 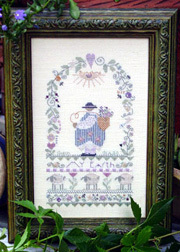 Their colors are charming and their use of variegated threads is lovely." Giulia states, "I marvel at the excellence of Merry's design work and especially love her three dimensional pieces. She has a special way of keeping the past alive and bright." Giulia refers to Tricia Wilson Nguyen as an inspiring designer. She further adds, "She has such a beautiful way of mixing the old and the new. 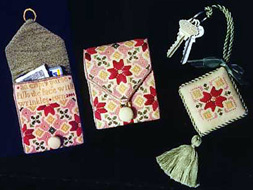 Tricia has designed little needlecases, scissors cases and many other pieces with a unique old-fashioned style, like those beautiful slippers to hold the scissors." "Sometimes I love to take out the Threads of Gold kits and booklets and spend a few hours looking at them. 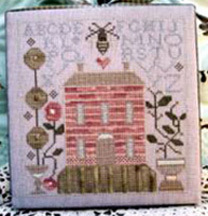 Edna designs gorgious samplers from the past and new pieces with old-fashioned charm. 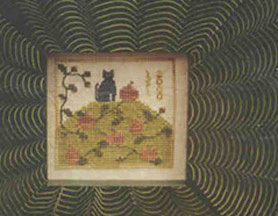 Her reproductions of antique samplers are truly stunning," states Giulia. We are grateful to Giulia for turning us on to these wonderful designers. 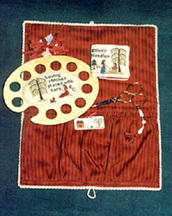 Designs not found on the Wyndham Needleworks site can be found on the Norden Crafts Ltd. Site at http://www.nordencrafts.com or on individual designer's sites listed above.